Just as a Chromebook is a laptop that runs Google’s web-based Chrome OS instead of Windows, a Chromebox is a low-cost desktop PC based on Chrome’s operating system. Most people will need Windows for their main PC, but if you want an extra machine simply to browse the web, use email and social media and do basic work, it’s certainly an option. Ms is the latest model from Asus, and the configuration we tested comes with an Intel Celeron 3215U processor and 4GB of memory for around £200. Asus’ plain yet subtly asymmetric case is deceptively well designed. It’s much smaller than a typical desktop PC but easy to take apart and upgrade if, for example, you want to add another stick of DDR3 RAM to the spare memory slot. The Chrome OS is so undemanding compared with Windows 10 that the low-end dual-core Celeron processor feels perfectly adequate, focusing all its efforts on tasks in the foreground to deliver satisfyingly nippy operation. 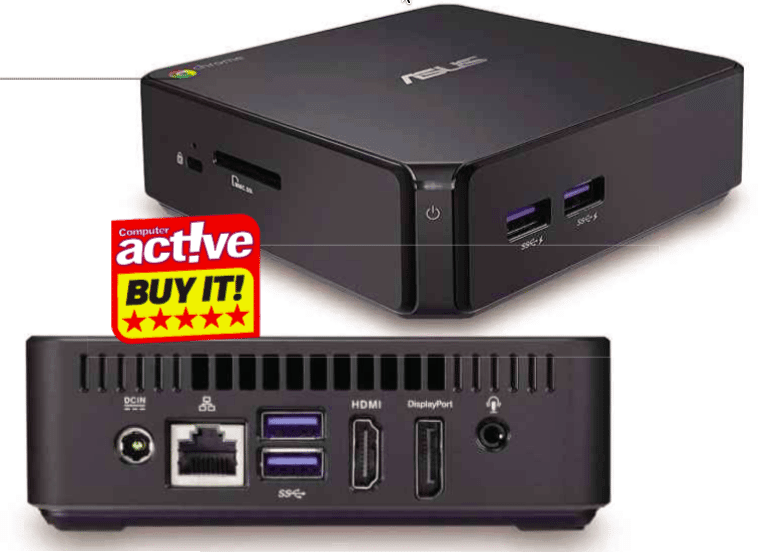 You can also buy this system with an i3 or even an i7 processor (for £362 and £464 respectively), but fast chips are wasted on computers that run Chrome OS. You can’t run Windows programs in Chrome OS, but there are plenty of web-based alternatives to be found through the Chrome Web Store. Google Docs and Sheets are perfect for work; Google Photos lets you browse and edit images; and the likes of Google Play, Spotify and Netflix are available for entertainment. You can even play some games, too, although the selection is limited and you won’t find 3D titles. You could, therefore, use this as a living-room media centre, taking up very little space under your TV or even strapped to the back of it (a bracket is included to fit standard VESA mounting points). Bear in mind that only those pricier models with Intel Core i-series processors will support 4K video, while the Celeron processor’s integrated graphics processor goes up to Full HD. here’s no DVD or Blu-ray drive built in. One distinct advantage of the Chromebox 2 G084U over most desktop PCs is that it’s incredibly quiet, thanks to its power-efficient components and fanless design. It’s kept cool by air flowing naturally through the vents, and we found it barely warmed up, even during resource-sapping tasks, the paltry 65W power supply indicates how little electricity it uses – more like a lightbulb than a computer – and when idle this falls to just six watts. The basic idea of Chrome OS is that you work online and keep all your documents in the cloud, and accordingly you get 100 GB of free Google Drive storage for two years. Ms should work fine if you have decent broadband without any data caps, but there’s 16GB of flash storage on board if you do want to store some flies on the computer, which also gives you somewhere to install apps. There’s a full-size SD card slot for more storage, along with 802.11ac Wi-Fi and Bluetooth 4.0. A pair of USB 3.0 ports sit at the front for easy access, with two more on the back along with HDMI and DisplayPort connectors for your monitor and an Ethernet port for wired networks. This Chromebox may be small, but it’s great value for money. Chrome OS isn’t going to replace Windows, but it’s surprising how much you can get done with online-only tools.